Backward linkages from foreign affiliates to domestic firms can enhance the benefits from FDI. Part One of WIR01 mapped the locational pattern of the extent to which countries attract FDI. A key factor determining the benefits host countries can derive from FDI are the linkages that foreign affiliates strike with domestically owned firms. Backward linkages from foreign affiliates to domestic firms are important channels through which intangible and tangible assets can be passed on from the former to the latter. They can contribute to the upgrading of domestic enterprises and embed foreign affiliates more firmly in host economies. Given the role that backward linkages can play in these respects, WIR01 analyses how host country governments can best promote efficient backward linkages by foreign affiliates. The approach is pragmatic. It draws on practical experience as to what firms have done to forge linkages, and the measures that governments have adopted to encourage linkages and their deepening. An underlying assumption is that, whatever the current level of backward linkages, linkages can be increased or deepened further, with a view towards strengthening the capabilities and competitiveness of domestic firms. Linkages offer benefits to foreign affiliates and domestic suppliers, as well as to the economy in which they are forged as a whole. For foreign affiliates, local procurement can lower production costs in host economies with lower costs and allow greater specialization and flexibility, with better adaptation of technologies and products to local conditions. The presence of technologically advanced suppliers can provide affiliates with access to external technological and skill resources, feeding into their own innovative efforts. The direct effect of linkages on domestic suppliers is generally a rise in their output and employment. Linkages can also transmit knowledge and skills between the linked firms. A dense network of linkages can promote production efficiency, productivity growth, technological and managerial capabilities and market diversification for the firms involved. Finally, for a host economy as a whole, linkages can stimulate economic activity and, where local inputs substitute for imported ones, benefit the balance of payments. The strengthening of suppliers can in turn lead to spillovers to the rest of the host economy and contribute to a vibrant enterprise sector. Where, as in developed countries, both buyers and suppliers are technologically strong and capable, knowledge flows run in both directions with a focus mainly on new technologies, products and organizational methods. Where, as in most developing countries, suppliers are relatively weak, the flows are likely to be more one-sided, from foreign affiliates (buyers) to domestic firms. They can also be expected to contain more basic technological and managerial knowledge, in that suppliers are likely to lag further behind international best practice frontiers; for this reason, they can be particularly important. Of course, not all linkages are equally beneficial for host economies. For example, in highly protected regimes, foreign affiliates may strike considerable linkages without much incentive to invest in the upgrading of suppliers’ technological capabilities. Instead, such linkages may foster a supplier base that is unable to survive international competition. Linkages developed in competitive environments and accompanied by efforts to enhance suppliers’ capabilities are likely to be technologically more beneficial and dynamic. The objective is not to promote linkages for their own sake, but to do so where they are beneficial to the host economy. The extent to which domestic firms benefit from linkages with foreign affiliates also depends on the nature of their relationship. The intensity of the interaction between buyers and suppliers is affected by the bargaining position of the two parties. A supplier of relatively simple, standardized, low-technology products and services is typically in a weak bargaining position vis-à-vis its buyer. Such suppliers may be highly vulnerable to market fluctuations, and their linkages with foreign affiliates are unlikely to involve much exchange of information and knowledge. Foreign affiliates only invest resources in building local capabilities when they expect such an effort to yield a positive return. Organizational changes are making supply chain management more critical to the competitiveness of firms, including TNCs. On average, a manufacturing firm spends more than half its revenues on purchased inputs. In some industries, such as electronics and automotive, the proportion is even higher. Some firms are contracting out the entire manufacturing process to independent “contract manufacturers”, keeping only such functions as R&D, design and marketing. In these cases, supply chain management obviously becomes even more important. A foreign affiliate – like any other firm – has three options for obtaining inputs in a host country: import them; produce them locally in-house; or procure them from a local (foreign- or domestically owned) supplier. The extent to which foreign affiliates forge linkages with domestic suppliers is determined by the balance of costs and benefits, as well as differences in firm-level perceptions and strategies. While the costs and benefits reflect a large number of industry-specific factors, the most important one concerns the local availability of qualified suppliers. Foreign affiliates producing primarily for the domestic market generally procure a larger share of inputs locally than export-oriented ones or those that are part of integrated international production systems. In the latter case, cost and quality considerations are particularly stringent, and affiliates tend to be guided by corporate global sourcing strategies. The lack of efficient domestic suppliers is often the key obstacle to the creation of local linkages. In many demanding activities, TNCs therefore actively encourage foreign suppliers to establish local facilities or prefer to produce in-house. Many TNCs have supplier development programmes in host developing countries. Efforts can include finding suppliers and ensuring efficient supply through technology transfer, training, information sharing and the provision of finance. The objective is usually to expand the number of efficient suppliers, and/or to help existing suppliers improve their capabilities in one or several areas. However, supplier development efforts are typically not extended to all suppliers. Foreign affiliates tend to focus on a limited number of suppliers providing the strategically most important inputs. Where supplier development is undertaken, however, TNCs often offer considerable support to suppliers by transferring technology, training suppliers’ staff, providing business-related information and lending financial support. The intensity of knowledge and information exchange in buyersupplier relationships tends to increase with the level of economic development of host countries, particularly in complex activities, and where technological and managerial gaps with suppliers are not too wide. Although foreign affiliates have an interest in creating and strengthening local linkages, their willingness to do so can be influenced by government policies addressing different market failures at different levels in the linkage formation process. For example, TNCs may be unaware of the availability of viable suppliers, or they may find it too costly to use them as sources of inputs. In developing countries, policies may be required to compensate for weak financial markets or weak institutions like vocational schools, training institutes, technology support centres, R&D and testing laboratories and the like. Well-designed government intervention can raise the benefits and reduce the costs of using domestic suppliers. The role of policy is most significant where there is an “information gap” on the part of both buyers and suppliers about linkage opportunities, a “capability gap” between the requirements of buyers and the supply capacity of suppliers and where the costs and risks for setting up linkages or deepening them can be reduced. The linkage formation process is obviously affected by a host country’s overall policy environment, its economic and institutional framework, the availability of human resources, the quality of infrastructure and political and macroeconomic stability. But the most important host country factor is the availability, costs and quality of domestic suppliers. Indeed, in addition to being a key determinant for the formation of efficient linkages, the technological and managerial capabilities of domestic firms also determine to a large extent the ability of a host economy to absorb and benefit from the knowledge that linkages can transfer. Weak capabilities of domestic firms increase the chances that foreign affiliates source the most sophisticated and complex parts and components either internally or from a preferred (foreign-owned) supplier within or outside a host country. For example, domestic firms in Taiwan Province of China and Singapore supply complex inputs to foreign affiliates, but far fewer do so in Malaysia, Thailand or Mexico. The international environment is evolving, as a result of globalization and liberalization, as well as changes in the international policy framework, including WTO agreements and other international arrangements. Some policy instruments traditionally used to foster linkages are now considered less relevant or are subject to new multilateral rules, such as the WTO Agreement on Trade-related Investment Measures (TRIMs) or the Agreement on Subsidies and Countervailing Measures. For example, local content requirements have been phased out by most countries. At the same time, FDI and trade liberalization, as well as more intense competition for FDI, have reduced the reliance on other investment performance requirements. Well-targeted incentives to support the creation and deepening of linkages can have a positive impact on linkages. Thought should be given to render this category of development-related subsidies non-actionable (i.e. not open to challenge) under WTO rules. On the other hand, preferential trade arrangements – with rules of origin based on the level of domestic value added or local content – can have important effects on FDI and linkage creation by TNCs in preference-receiving countries. In general, these effects are the more significant, the higher the preferential margin associated with rules of origin and the lower the related administrative costs. Linkage effects of rules of origin, however, also depend on local supply capacity. This new international setting has, thus, changed the scope for national policy options. There is, however, flexibility within the existing international policy framework, e.g. in the form of extension of transition arrangements and differential treatment of countries at different levels of development. While some agreements are subject to further review, the challenge for policy makers is, therefore, to make use of the options allowed within the current framework, as well as other policy measures that are not subject to multilateral rules to integrate FDI more deeply into their national economies and, in particular, benefit from backward linkages. In this new policy environment, active policy approaches that work with the market are at a premium. Whereas there is no universally established best practice in linkage promotion policy, important lessons can be drawn from past experience. Linkage promotion policies, like other development policies, are often highly context specific and need to be adapted to the specific circumstances prevailing in each host country (figure 3). They need to be an integral part of broader development strategies, and their success often depends on factors that may not appear in a narrow assessment of linkages policies. Much also depends on how policies are designed, coordinated and implemented in practice. One approach involves encouraging linkages through various measures to bring domestic suppliers and foreign affiliates together and to strengthen their linkages in the key areas of information, technology, training and finance. This is a broad approach – it basically improves the enabling framework for linkages formation. A review of the experience of host countries yields a long menu of specific measures that can be taken in this respect. Such measures can include, for example, the provision of information and matchmaking to help domestic firms link up with foreign affiliates; encouraging foreign affiliates to participate in programmes aimed at the upgrading of domestic suppliers’ technological capabilities; promoting the establishment of supplier associations or clubs; the joint provision of services (especially training); and various schemes to enhance domestic suppliers’ access to finance. …perhaps best in the framework of a special linkage promotion programme. Another approach goes further in that it involves the establishment of a specific linkage promotion programme combining a number of the measures just mentioned. This is a proactive approach which is typically focused on a selected number of industries and firms, with a view towards increasing and deepening linkages between foreign affiliates and domestic firms. As with other policies that span a range of productive factors, activities and enterprises, it is advisable for policy makers that choose this approach to “start small” (perhaps with a pilot scheme) and to build policy monitoring, flexibility and learning into the programme. The need for starting small is all the greater when resources are scarce. Moreover, it is essential for any programme to seek close collaboration with the private sector, both foreign affiliates and domestic suppliers, in design and implementation. Some countries have in fact set up specific linkage programmes involving a combination of different policy measures, and targeting selected industries and firms. Such programmes have been put in place primarily by countries with a large foreign presence and with a (relatively) well-developed base of domestic enterprises. The Czech Republic, Hungary, Ireland, Malaysia, Mexico, Singapore, Thailand and the United Kingdom have all made special efforts of this kind. Some of the programmes are organized at the national level while others have been implemented as regional or local initiatives. Three elements are common to them: the provision of market and business information; matchmaking; and managerial or technical assistance, training and, occasionally, financial support or incentives. Some programmes have also included FDI promotion activities, to attract foreign investors in targeted industries. In each case, sustainable linkages will only be created if both foreign affiliates and domestic firms can benefit from them. The general features of a special Linkages Promotion Programme are set out below. Such a programme should be seen more as a set of building blocks that countries might “mix and match” according to their specific circumstances, rather than a ready-made prescription that all countries can apply. Clearly, the choice of measures and the way they are combined must reflect the level of development, policy capabilities, resources and objectives of each country. Even countries at similar levels of development may choose different configurations of policy according to their enterprise and institutional capabilities. The starting point for an effective linkage programme is a clear vision of how FDI fits into the overall development strategy and, more specifically, a strategy to build production capacity. The vision has to be based on a clear understanding of the strengths and weaknesses of the economy and of the challenges facing it in a globalizing world. A linkage programme should, in particular, address the competitive needs of domestic enterprises and the implications these have for policies, private and public support institutions and support measures (including skills- and technology-upgrading). Initiating a public -private sector dialogue (perhaps in a “Linkage Forum”) with stakeholders, including foreign affiliates (and especially their procurement officers), supplier industry associations, chambers of commerce, banks, service providers, trade unions and government agencies (such as investment promotion agencies, development corporations, industrial zone authorities, industry development agencies). Disseminating “best practice” experiences based on companies’ programmes and actions and experiences of government programmes and measures in other countries. Identifying the targets of the programme Governments, in cooperation with private sector institutions, need to define the targets of a programme in terms of the industries and, within them, the foreign affiliates and domestic suppliers to be involved. the technology content of the activity and the scope for moving up the value-added chain.Such an analysis is essential for any linkage strategy – without it, a government cannot decide how to allocate scarce resources. It also has to take into account trends in the growth and spread of international production networks and their implications for domestic producers, drawing, among others, on continuous dialogue with key stakeholders. Foreign affiliates can be selected according to their willingness and potential to establish beneficial linkages. Beyond that – and as part of their FDI promotion – governments can target TNCs that are particularly interested in developing strong supply links with domestic enterprises. The linkage programme may even support local managers of foreign affiliates in lobbying their head offices to allow greater autonomy in sourcing. In-depth consultations with foreign affiliates can then identify their specific linkage needs. Suppliers can be selected on the basis of their commitment and capabilities (or potential capabilities) to meet the needs of foreign affiliates. “Commitment” can be tested through certain self-improvement requirements, with some external guidance and minimal support during the initial stage of selection. Other criteria that can be used involve technological benchmarking and skills audits. Specific criteria that have been used include the size of the firm, production capabilities, ISO certification and age. However, one of the most important elements to take into account is the commitment of key managers (and especially the chief executive officer) to the idea of continuous improvement and their willingness to upgrade their operations to meet international standards required for successful linkages. The active cooperation of chambers of commerce, business associations, support centres, service providers and other private sector institutions is very important here, as is the cooperation of SME development programmes, be they local or international. (UNCTAD’s EMPRETEC programme is an example of the latter.) “Linkage Workshops” for representatives of foreign affiliates and local enterprises could provide the mechanism through which eventual programme participants can be narrowed down. Subsequent “Business Clinics” for Linkage Workshop participants could then allow for one-to-one consultations for pairs of linkage partners. Firms prepared to go further could thus undertake operational and management audits to determine the strengths and weaknesses of domestic partners. Identifying specific measures to be adoptedGovernments need to be aware of actions already taken by foreign affiliates and domestic firms (table 8). Some of these may need to be encouraged and supported. Governments can also act as facilitators and catalysts and ensure that private institutions have the incentives and resources needed. They can be particularly proactive in the following key areas of linkage formation: information and matchmaking; technology upgrading; training; access to finance (table 9). The range of measures that can be taken in each of these areas is wide. Their principal purpose is to encourage and support foreign affiliates and domestic firms to forge and deepen linkages. They are outlined – individually and as contained in programmes – in the main body of WIR01.They constitute a menu from which governments can mix and match. Specific choices depend on the results of earlier consultations with existing support institutions and relevant programmes in the public and private sectors, as well as with key stakeholders on the specific needs of an industry or set of firms. The results of the Linkage Forums, Linkage Workshops and Business Clinics mentioned earlier and the identification of promising domestic firms are also of help here. Governments could also encourage participating foreign affiliates to agree to a coaching and mentoring arrangement with promising local firms. These measures can be underpinned by efforts to strengthen the negotiating position of local firms vis- à-vis foreign affiliates; for instance, by guidelines or making model contracts available. Special informal mechanisms can also help resolve problems and disputes and contribute to more lasting linkage relationships.The result should be a clear and feasible programme of action. Naturally, at each step of the implementation of a programme, the government needs to have a clear idea about the costs involved and the resources available. Setting up an appropriate institutional and administrative framework to implement and monitor the programmeGovernments can choose from a number of options in designing the institutional framework for a linkage programme: Make the programme a distinct part of an existing body or even set up a special national-level linkage programme under an independent body to act as the focal point for all relevant activities by different departments and institutions.Leave the design and implementation of the linkage programme to local authorities, with central advice, encouragement and support from the central government. This approach might be preferable in large countries or where resources for linkage programmes are limited, or where regions have distinct combinations of locational advantages to offer. Involve the private sector as the main executing agency for the linkage programme. Suppliers, affiliates or their associations may set up such a body.The role of the government would be to act as catalyst and fulfil regulatory and information functions. The size of a programme depends on the objectives sought and the resources available. Some programmes benefit from external funding through financial assistance provided by donor countries. In the longer term, however, the financial sustainability of linkage programmes if directly run by governments, requires sufficient government funding support. Moreover, cost sharing by participating firms (both buyers and suppliers) is desirable, not only for funding purposes but also for assuring self-commitments of the participants. This is feasible, especially when a programme has demonstrated its usefulness and is recognized for its services. Needless to say, to create trust and credibility among enterprises, a programme must be staffed by professionals with the appropriate private sector-related skills and background. Linkage programmes can only work if they are networking effectively with efficient intermediate institutions providing support in skill building, technology development, logistics and finance. These include standards and metrology institutes, testing laboratories, R&D centres and other technical extension services, productivity and manager training centres and financial institutions. These can be public or private. It is also important that linkage programmes work closely with relevant private associations – chambers of commerce and industry, manufacturers’ associations, investor associations and so on. Trade unions and various interest groups are other important stakeholders. Outreach: the number of companies included in the programme over time. Impact: the impact of the programme can be judged by such indicators as the number of suppliers, linked up with foreign affiliates over time; the value of deals and changes in these over time; the share of domestic suppliers in the procurement by foreign affiliates; the extent to which R&D activities are being undertaken by domestic suppliers over time (including those resulting in patents); changes in export volumes; the improvements in productivity or the value added at the firm or industry level; and whether a local supplier establishes itself abroad. Cost effectiveness: the cost of the programme in light of the results achieved and the benefits obtained as defined by the objectives laid out at the beginning of the programme. It is worth repeating that linkage programmes build on the mutual self-interests of foreign affiliates and domestic firms. Linkages are a stepping stone towards strengthening the competitiveness of domestic firms, giving them a foothold in international production networks and embedding foreign affiliates fully in host economies. 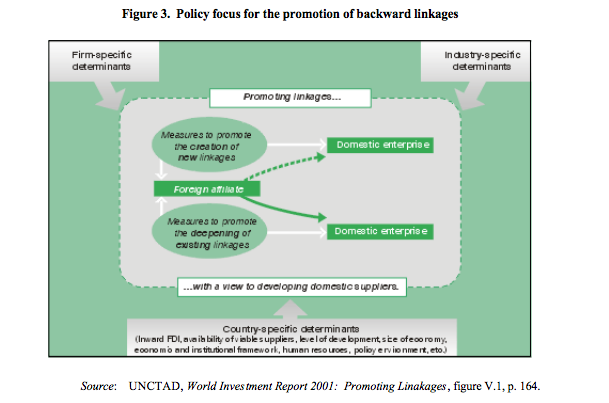 At the same time, linkage programmes should be seen as part of a broader set of FDI and SME policies. As networks of viable suppliers often prosper in clusters of firms, attention needs to be given to the development of such clusters, particularly for knowledge-intensive industries and activities. The third generation of FDI promotion policy – targeting foreign investors at the level of industries and firms and using clusters to attract FDI (and, in turn, strengthening clusters through it) – has a role to play here. In fact, the more linkage promotion policies that go hand-in-hand with SME development and targeted FDI promotion policies, the more they are likely to be successful. Backward linkages from foreign affiliates to domestic firms can enhance the benefits from FDI. TNCs have a self-interest in forging links with domestic suppliers,… …but governments can play an important role in promoting linkages... …perhaps best in the framework of a special linkage promotion programme.